Tina Malia is a visionary musical artist. Her sonic palette encompasses sacred chant, world, dream pop and folk styles. A prolific singer, songwriter, instrumentalist and sound engineer, Malia expresses her radiant inner landscape through song. Tina's mother, a renowned concert pianist and opera singer from South Korea, was the driving force in Tina's classical musical education. It was her father, however, who bought her a guitar when she turned 15 and encouraged her to follow her musical passions. "I remember first discovering many great women of folk music – Joni Mitchell, Joan Baez, Ani DiFranco, Alison Krauss. Listening to them was basically how I learned to play the guitar, and it's also when I starting writing my own songs," says Malia. With guitar and backpack in hand, she began traveling the world and writing music, with her adventures in nature and spirituality inspiring her compositions. 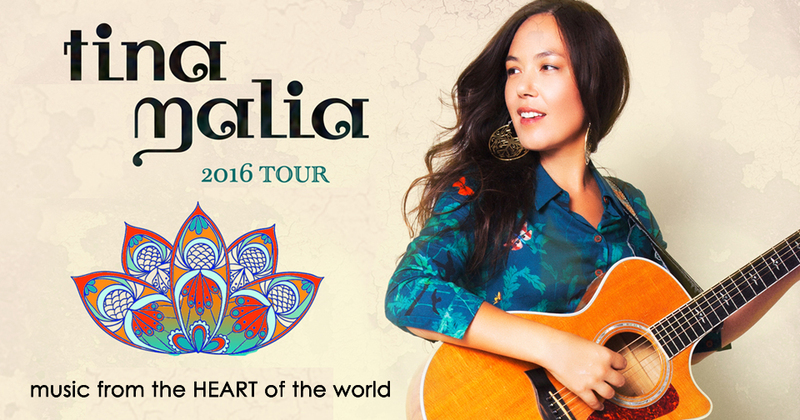 Not long after the release of her first album, the accolades winning Shores of Avalon, Tina met pioneering world chant artist Jai Uttal, who recruited her to sing in his groundbreaking ensemble – the Pagan Love Orchestra. It was through Jai that Tina was introduced to the rich spiritual tradition of Sanskrit mantras. "When I first started singing with Jai," recalls the Amida recording artist, "I didn't understand the power and beauty that is held within a mantra. But later, when I was going through a difficult time in life, I was able to turn to this practice and receive the healing that comes with the repetition of these sacred sounds. To this day, I attribute my sense of well-being to chanting mantra. It is so simple and yet so extraordinary." Tina Malia is a beloved pioneer in a growing community of people around the world dedicated to residing in harmony with the Earth, and expressing it through art, health, education and music. Her all-encompassing musical and spiritual perspective have led her to the studio and live performance with a vast array of iconic artists including Kenny Loggins, India.Arie, Bonnie Raitt, Bassnectar, Deva Premal and Miten, Omar Faruk Tekbilek, Peter Yarrow (of Peter, Paul & Mary) Peter Kater and Joanne Shenandoah. Tina's acclaimed catalog of self-produced albums includes Shores of Avalon, Jaya Bhagavan, The Silent Awakening, The Lost Frontier and now, Bridge to Vallabha. © 2019 BrightStar Live Events on behalf of Tina Malia Music (GBP). All sales are final. Tickets are non-refundable.